Villa Ca n'Estel is an spacious, newly constructed 4 bedroom villa with separate studio, centrally located in quiet residential area of Cala d'Or. Close to beach, port, restaurants and shops. Full ground level facilities for disabled people. Comfortable modern furnishings in Ibizan style with satellite TV. Beautiful landscaped gardens with built in BBQ and a large swimming pool with terraces. Pool without chemicals, salt system. english, french, german, spanish, italian, Català. Because it is a new Villa. It is situated in the old centre of Cala d'Or. It is close to centre, beach and harbour. Because I will be always available to help you. Because once you have made your reservation there will be no intermediaries other than you and me. 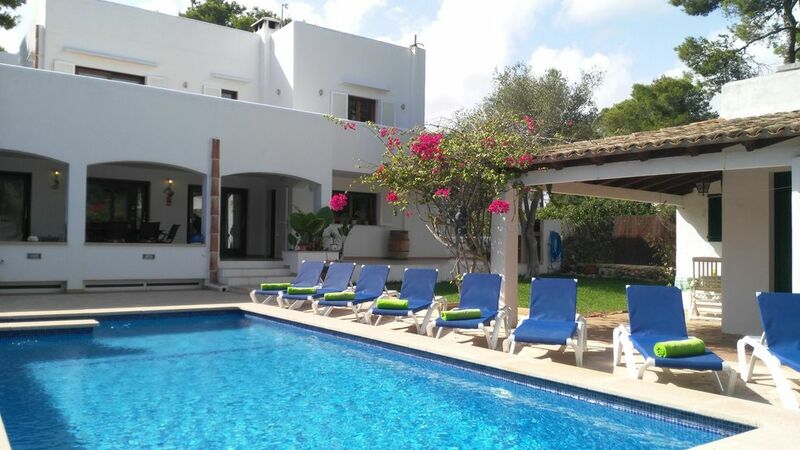 "VILLA CA N'ESTEL" is a new villa, situated in a quiet residential area, located between the beaches of Cala d'Or, the marina, and the center of Cala d'Or, with its shops, restaurants, bars , pups. Regarding the situation of the village, you enjoy a vacation without having to take the car to move. Very handy if you go with children or adults or if you want to enjoy the nights out in Cala d'Or. Come and enjoy!!! Villa SOL NAIXENT Owners REf. B1418( Rising Sun) is perfect for a holiday with friends or family. Since the village is divided into two parts, ground and first floor you have the possibility to enjoy intimacy that give you the two levels. You can enjoy the morning in a spectacular sunrise in front of your room, and full moon nights with a glass of wine and good company. Come and enjoy!! And for season 2016 we have a very nice villa in Cala Esmeralda, only 3 minutes walk to Cala Gran Beach and Cala Esmeralda Beach. And 5 minutes Walk to Cala d'Or centre. If you need some more information, please feel free to contact me. Margalida Vicens. toilet, shower, Outdoor bathroom with shower with hot water, wc, etc. En-suite bathroom with bath and separate shower for bedroom 1. Family shower room for bedrooms 2 and 3. En-suite bathroom with bath and shower for bedroom 4. En-suite bathroom with bath and shower for studio. AC in all the bedrooms. It goes with a timer (5 hours a day). Heating is not included on the price. We charge 30€ a day in case you wish to use it. We provide Villa Towels, you should bring your beach/pool Towels. Large living room overlooking the swimming pool. Comfortably furnished with television, satellite and DVD. PIANO. Please feel free to use it, but please note it is not a toy. Completely equipped kitchen with dishwasher, microwave, fridge/freezer, electric oven and hob, hood, electric kettle, toaster and coffee maker. It has also all kitchen utensils and cutlery, pots and pans. Separate kitchen in studio. If you wish to have one day fun in a nice boat, get in touch with Margalida and I will help you to book one with skyper or without. Only 3km to the nearest golf course of Vall D'Or, 18 holes. The beautiful Vall D'Or golf course is an easy 10 min drive. This is an 18 hole course with excellent fairways and greens. It has some stunning sea views. The clubhouse is very well equipped with a large bar/restaurant area and lovely big sun terrace overlooking the course, with the sea behind. 7 other golf courses within a 45 minute drive La Reserva Rotana, San Antem West, San Antem East, Pula, Golf Son Servera, Canyamel, Capdepera Golf. Please note: Pool is not feneced, please take care of your children. Notes on accommodation: The villa is perfect for families with children. It can be available during winter months , it has a heating system. There is Air Conditioning in all the bedrooms Outside: The house is surrounded by a garden, completely enclosed. It has large terraces on the ground floor and on the first floor. It has plenty of outdoor furniture on the terraces and near the pool. The private pool size is 8 by 4.5m and has a shallow end. Its depth is 1m to 2m. Please note that the pool is not fenced. Utility Room: Washing machine, iron and ironing board. Cleaning / Towels / Linen / Maid service: Bed sheets and towels are provided. If the stay is longer than a week, the linen will be changed. Other: The studio is self-contained and consists of bedroom with small seating area, kitchen and bathroom. Can only be rented in conjunction with the main villa. On the price studio is not incluied. The villa was very clean, spacious, and well maintained. Myself, wife, daughter, son in law, grandson, and friend had a great time in this villa, my grandson loved the swimming pool, the owner Margalida was very helpful and friendly, we will be back next year. The walk into town, Marina and beach was only a 5 minute walk from the villa. Margailda was very welcoming and hospitable. Her villa was great - ideal location for the main town, the marina and the beach - yet seemed quite secluded. Couldn't have asked for more - we all had a great week. Many thanks Margalida. Furnishings are tired and need updating, fencing in garden was broken. Towels were gray when they should have been white and were hard. Owner locked away the remote control for the heating and informed me it would cost an extra €25 a day even though the heating was meant to be included in the price and it was freezing the first 2 days of our stay. Half of the wardrobes were locked and stored with the owners belongings.There was no essentials included, no salt, pepper or even cleaning equipment even the glasses were dirty. The washing machine was completely rusty and we had to use it to try and wash the gray towels. I am very sorry for your discontent with our villa. The towels are not white if not beige. As you can see in the advertisement heating is paid separately, and we gave it free. All the cabinets of the house are for the use of our customers, although it is true that the upper part (the attics are closed) which is not an inconvenience since all the rooms have more than enough space to store all their things. Maybe there was no salt or pepper, but there was fresh water and beers in the fridge. We also give you a bottle of wine to celebrate your mother's birthday. The washing machine has a little rust on the outside, it is due to the proximity of the sea, although it is not inconvenient to wash clothes. The garden fence belongs to the neighbor and he has already told us that he will change it. nothing to fault with this villa, perfect location on a nice quiet street, but central to everything. Just had to write to say what a lovely time we had staying in your villa. Its all about the location, perfect for the beach, 2minutes, the Marina 5 minutes and the bars and restaurants in town 5 minutes, all being walked at a slow majorcan pace!!! The pool was wonderful and the terrace beautiful and cool for eating breakfast, or late night BBQ. A perfect family villa, easy to watch the children in the pool and gardens, whilst making lunch or dinner or simply sitting on the terrace sipping a glass of rose. The villa itself had all the little extras that make life away with teenagers easier, TV, DVD, and WIFI ! Also the area is so very safe that you feel totally relaxed about letting them going to the centre to get ice creams, drinks, or go to the beach on their own. On arrival, Margalida, the owner was there to help us settle in, with lots of useful ideas for which restaurants were good this year, and best quiet beaches, all the things only a local would know, the villa had just been cleaned and was spotless, all the outside terraces washed , the pool sparkling, there were even pool toys already blown up! We would definitely book the Villa Ca n’ Estel again, and I have already recommended it to my friends. Rental boats can be booked on request. The nearest sandy beach is Cala d'Or, 1 minute walk from the villa. 2km to the natural beach of Cala s'Anau. The nearest beaches are, Cala d'Or beach,Cala Gran, Cala Esmeralda, Cala Ferrera, Cala Egos. 15 minutes drive from the Natural Parc of Cala Mondragó and s'Amarador. From Palma airport it takes approx 45 mins. Please inform me if you wish a private transfer to come to the airport to pick you up and drive you strait away to the villa, where I will be there to welcome you. 2 minutes walk to Cala d'Or centre, Marina and Cala d'Or beach. Local restaurants and shops nearby, and markets on weekends. Public swimming pool heated in winter 10 minutes driving from the villa. Open from 9am - 9pm. Sunday close. Local Markets - Monday: Manacor. Tuesday: Porto Colom. Wednesday: Santanyi and Puerto Pollensa. Thursday: Inca and Campos. Friday: Llucmajor. Saturday: Santanyi, Palma and Campos. Sunday: Felanitx and Porto Cristo.